Mr. Parr is President of IPRA, Inc. He is an expert in determining the value of intellectual property. His books are published in Japanese, Korean, Italian, Chinese, Romanian and Russian. Mr. Parr has completed complex consulting assignments involving the valuation and pricing of patents, trademarks, copyrights and other intangible assets. His opinions are used to accomplish licensing transactions, acquisitions, transfer pricing, litigation support, collateral-based financing, and joint ventures. Mr. Parr also has served asan expert witness regarding intellectual property infringement damages. Mr. Parr also publishes three royalty rate resource books, which have been sold all over the world. These books are dedicated to reporting detailed information about the economic aspects of intellectual property transactions including licensing and joint ventures. Past assignments have included the valuation of the Dr. Seuss copyrights and the patent portfolio of AT&T. Mr. Parr has also conducted valuations and royalty rate studies for pharmaceuticals, semiconductor process and product technology, agricultural formulations, automotive battery technology, biotechnology, camera technology, chemical formulations, communications technology, computer software, cosmetics, consumer and corporate trademarks, drug delivery systems, flowers, incinerator feed systems, lasers, medical instrument technology, motivational book copyrights. Coursework toward Ph.D. in the International Business Management Program at Rutgers University. Rutgers Alumni Association Class of ’31 Award. Royalty Rates for Licensing Intellectual Property, author, John Wiley & Sons, Inc. Hoboken, New Jersey, 2007Royalty Rates for Technology, Third Edition, Intellectual Property Research Associates, Yardley, Pennsylvania, 2003. The Royalty Rate Report for Pharmaceuticals & Biotechnology, Sixth Edition,Intellectual Property Research Associates, Yardley, Pennsylvania, 2006. Royalty Rates for Trademarks & Copyrights, Third Edition, Intellectual Property Research Associates, editor, Yardley, 2004. Technology Licensing – Corporate Strategies for Maximizing Value, co-author, John Wiley & Sons, Hoboken, New Jersey, 1996. Translated into Chinese. Intellectual Property: Valuation, Exploitation & Infringement Damages, co-author, John Wiley & Sons, Hoboken, New Jersey, 2005. Valuation of Intellectual Property and Intangible Assets, Third Edition, annually supplemented, co-author, John Wiley & Sons, Hoboken, New Jersey, 2000. Investing In Intangible Assets: Finding and Profiting From Hidden Corporate Value,author, John Wiley & Sons, Hoboken, New Jersey, 1991. Intellectual Property: Licensing and Joint Venture Profit Strategies, Third Edition, annually supplemented, co-author, John Wiley & Sons, Hoboken, New Jersey, 2004. Intellectual Property Infringement Damages: A Litigation Support Handbook, Second Edition, annually supplemented, author, John Wiley & Sons, Hoboken, New Jersey, 1999. 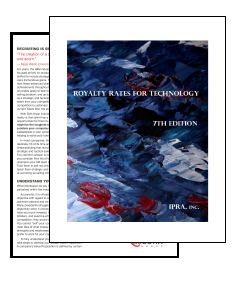 Royalty Rates for Technology, Third Edition, Intellectual Property Research Associates, Yardley, Pennsylvania, 2003. Investment Theory For Royalty Rates, co-authored, les Nouvelles – The Journal of the Licensing Executive Society, December 1987, page 95. Royalties – Fair Rates of Return, Patent World, July 1988, page 36. IRS White Paper On Intercompany Pricing, co-authored, Trademark World, February 1989, page 28. Brand Name Buying, Registered Representative, February 1990, page 46. The Inefficient Market for Intellectual Property: An Update on the Global Scene, The Journal of Proprietary Rights, February 1990, page 17. Royalty Rate Economics, European Intellectual Property Review, April 1990, page 133. No Name. No Gain, Personal Investor, May 1990, page 27. An Economic Approach to Royalty Rate Determination Part I of III, co-authored, The Journal of Proprietary Rights, June 1990, page 19. An Economic Approach to Royalty Rate Determination Part II of III, co-authored, The Journal of Proprietary Rights, August 1990, page 17. How To Make Money By Investing In Innovative Leaders, Boardroom Reports, August 1, 1991, page 14. An Economic Approach to Royalty Rate Determination Part III of III, co-authored, The Journal of Proprietary Rights, September 1990, page 17. Determining Royalty Rates for Intellectual Property by Using a Discounted Cash Flow Analysis Pricing, Business & Tax Planning Quarterly, Fall 1990, page 23. The Power of Trademarks in Mature Industries, Licensing Product Times, Fall Issue 1991, pg. 1. The Future is Intangible: Licensing and Joint Venturing Will Create Higher Corporate Value, International Company and Commercial Law Review, page 313. Intangible Asset Investing: Basic Trend of ’90s, Successful Innovator, March-April 1992, Vol. 1 No. 3, page 6. Valuation Issues in Transfer Pricing, chapter co-author, Transfer Pricing Handbook, edited by Robert Feinschreiber, published by John Wiley & Sons, 1993. The Doubled-Barreled Benefits of Acquiring a Brand, Mergers & Acquisitions, March-April 1993, page 36. The Future Is Intangible, The TQM Magazine, March-April 1993, page 7. Emergence of Intellectual Property Exploitation Strategies, The Licensing Journal, May 1993, page 10. The New Role of Intellectual Property in Commercial Transactions, edited by Melvin Simensky and Lanning G. Bryer, published by John Wiley & Sons, 1994. Intellectual Property Takes Center Stage, Multimedia and Technology Licensing Law Report, July 1994, page 1. Royalty Rates in General and on Average, The Journal of Technology Transfer, September 1995, Vol. 20, No. 2, page 22. Damage Awards, The IP Litigator, November/December 1995, Volume 1, Number 1, page 23. IP Leverage, Chapter Thirteen of the book titled From Ideas to Assets, edited by Bruce Berman and published by John Wiley & Sons, New York, 2002. Royalty Rates In and Out of Litigation, presented at the Law Seminars International conference titled Complex Intellectual Property Licensing, Philadelphia, Pennsylvania, May 19, 2005. Valuation of Patents Using the Relief from Royalty Approach, presented at the National Association of Certified Valuation Analysts Twleve Annual Consultants’ Conference, Philadelphia, Pennsylvania, June 2, 2005. Recent Royalty Rate Trends in Technology Licensing, presented to the Licensing Executives Society Annual Conference, San Diego, California, Illinois, September 24, 2003. Calculating Royalty Rates, presented to the Licensing Executives Society Annual Conference, San Diego, California, Illinois, September 23, 2003. Royalty Rate Derivation Methods, presented to the Licensing Executives Society Annual Conference, Chicago, Illinois, October 2002. Royalty Rates for Technology, presented to the Licensing Executives Society Chicago Chapter, Chicago, Illinois, February 26, 2002. Valuation and Royalty Rate Methods for Pharma and Biotech, presented at the Strategic Research Institute conference titled Pharma Biotech: Intellectual Property and Business Development, Crowne Plaza Hotel, San Francisco, California, April 23, 2001. Intellectual Property Valuation Issues and Strategies, presented at the Singapore-WIPO Joint Training Course for Asian and Pacific Region on Intellectual Property and Technopreneurship Development, November 16, 1999, Hotel Rendezvous, Singapore, Jointly sponsored by World Intellectual Property Organization and the Government of Singapore. Intellectual Property Valuation presented at the 10th Annual Cyberspace Licensing in the Electronic Age conference, sponsored by Glasser LegalWorks, Marriott Marquis, New York City, November 8, 1999. Methods for the Valuation of Intellectual Property, presented at Seminario Internaional sobre Valorization de la Propiedad Intelectual, November 19 and 20, 1998, Sheraton Hotel, Lima Peru, sponsored by INDECOPI of Peru and the World Intellectual Property Organization, of the United Nations. Valuing Intellectual Property: What’s it Worth? presented at the American Conference Institute’s conference titled Intellectual Property in Business Transactions, The Park Lane Hotel, New York City, January 30, 1997. Economic Factors for Intellectual Property Portfolio Management presented at the Licensing Executives Society E4 Committee Winter Conference titled Portfolio Management Strategies, Crystal Gateway Marriott, Crystal City, Virginia, December 12, 1996. Basic Intellectual Property Valuation for Licensing Executives presented at the 1996 Licensing Executives Society Conference, El Conquistador Resort, Fajardo, Puerto Rico, September 30, 1996. Intellectual Property Valuation and Licensing, presented to the Office of Corporate Relations and Technology Transfer of Rutgers University, co-hosted with Michael J. Lennon of Kenyon & Kenyon, Piscataway, New Jersey, June 26, 1996. Establishing Royalty Rates for Business Transactions, presented at the conference titled The Basics of Licensing and Licensing Law, sponsored by The Licensing Journal, Kent Press, The University Club, New York, New York, March 27, 1996. Computation of Damages, presented at the conference titled The Basics of Intellectual Property Litigation, sponsored by The IP Litigator, Kent Press, The University Club, New York, New York, March 28, 1996. Intellectual Property Valuation, presented at the American Intellectual Property Law Association, 19th Mid-Winter Institute – The Law of Computer Related Technology IV, La Quinta Resort Hotel, Palm Springs, California, January 26, 1996. A Conflicted Global Economy, presented at the 1995 Licensing Executives Society Annual Conference, Marriott’s Orlando World Conference Center, Orlando Florida, October 24, 1995. Technology Licensing Strategies, presented at the 1995 Licensing Executives Society Annual Conference, Marriott’s Orlando World Conference Center, Orlando Florida, October 25, 1995. Panel Discussion on Valuing Preclinical Trial Biodiagnostic Technology, presented at the 1995 Licensing Executives Society Annual Conference, Marriott’s Orlando World Conference Center, Orlando Florida, October 26, 1995. Valuation of Intellectual Property, presented at the First Annual Licensing Seminar of the New Jersey Intellectual Property Law Association, Woodbridge Hilton, Iselin, New Jersey, October 19, 1995. Intellectual Property Valuation, presented at the Advanced Licensing Institute of the Franklin Pierce Law Center, Concord, New Hampshire, July 26, 1995. Intellectual Property Infringement Damages, presented at the American Society of Appraisers, Philadelphia Chapter, Business Valuation Conference, Sheraton of Bucks County, Fairless Hills, Pennsylvania, April 21, 1995. Technology, Royalty Rates & Investment Risk, presented at the 1994 Licensing Executives Society Annual Conference, Hilton Waikoloa Village, Waikoloa, Hawaii, October 19, 1994. Quantifying and Valuing Royalties for Intellectual Property presented at the annual conference of The Intellectual Property Institute for Corporate Counsel at Le Meridien Hotel, Chicago, Illinois, September 26, 1994. Royalty Rate Negotiations, presented to the New Jersey Entrepreneurial Network, Princeton, New Jersey, June 1, 1994. Valuing Intellectual Property presented at the American Society of Appraisers conference titled Current Topics in Business Valuation ’94 at The Warwick Hotel, New York City on May 17, 1994. Valuation of Intellectual Property Rights presented at the Fourth Annual American Law Institute-American Bar Association Course of Study titled Trademarks, Copyrights, and Unfair Competition for the General Practitioner, Stouffer Concourse Hotel, Washington, DC, April 15, 1994. Technology Royalty Rates presented at the Association of Federal Technology Transfer Executives at the Los Angeles Airport Marriott, January 26, 1994. The Wall Street Perspective – Brand Values presented at the conference titled Brands sponsored by Strategic Research Institute at The Grand Hyatt Hotel, New York, New York, November 10-11, 1993. Quantifying and Valuing Royalties for Intellectual Property presented at the annual conference of The Intellectual Property Institute for Corporate Counsel at the Hyatt Regency, San Francisco, September, 30, 1993. The New Role of Intellectual Property in Commercial Transactions presented as part of the Executive MBA Seminar Series at the Leonard N. Stern School of Business, New York University, New York City, March 26, 1993 and June 21, 1993. Appraising Intellectual Property, sponsored by the American Society of Appraisers at Hyatt Regency at Reunion, Dallas, Texas, January 11, 1993. Valuation and Royalty Rate Determination presented at the conference titled Licensing Opportunities in the Pharmaceutical and Biotechnology Industries sponsored by The Institute for International Research, Park Hyatt Hotel, Washington DC, December 2, 1992. Strategies for Intellectual Property Valuation, Exploitation and Underwritingsponsored by the Institute for International Research presented at the Park Lane Hotel, New York on May 18-19, 1992. Valuation of Technology presented at the conference titled Joint Ventures and Other Cooperative Business Arrangements sponsored by Prentice Hall Law & Business and presented at the Loews-Summit Hotel on October 30-31, 1990. Valuation of Technology presented at the conference titled Joint Ventures and Other Cooperative Business Arrangements sponsored by Prentice Hall Law & Business and presented at the Four Seasons Clift Hotel on November 9-10, 1991. Advanced Valuation of Intellectual Property presented at the International Conference of the American Society of Appraisers in Washington DC on June 15, 1987. Issue: Infringement damages regarding agricultural-genetic patented invention. Issue: Infringement damages regarding personal computer Form Factor. Case: Honeywell International v. Hamilton Sundstrand, Inc. Civil Action No. 99-309-GMS (Sleet), United States District Court for District of Delaware. Issue: Infringement damages regarding auxiliary power unit engine technology. Case: BioNumerik Pharmaceuticals, Inc. v. M. Gopal Nair, American Arbitration Association, No. AAA 70 181 0030900, Austin, Texas. Issue: Damages to intellectual property and business value from failure to perform contracted obligations. Case: Plant Genetics Systems v. DeKalb ., Civil Action No. 3:96CV02015, United States District Court for Connecticut, East Hartford. Issue: Infringement damages regarding glufosinate resistant (Liberty herbicide) corn seeds. Case: Plant Genetics Systems v. Novartis, Civil Action No. 96-459, United States District Court for the District of Delaware, Judge Farnan. Case: Pocklington Foods, Inc. v. Her Majesty the Queen in Right of the Province of Alberta as Represented by the Provincial Treasurer of Alberta, Court of Queens, Bench of Alberta, Judicial District of Alberta. Issue: Appropriate methods for valuing expropriated trademarks. Case: CFMT, Inc. and CFM Technologies, Inc. v. Steag Microtech, Inc. Civil Action No. 95-442 (McKelvie), United States District Court for the District of Delaware. Issue: Infringement damages regarding semiconductor manufacturing equipment patent. Case: The Procter & Gamble Company v. Paragon Trade Brands, Inc., C.A. No. 94-16-LON, United States District Court for the District of Delaware, Wilmington, Delaware. Issue: Infringement damages regarding disposable infant diaper patents. Case: Ensco Inc. v. Komar Industries, No. LR-C-93-159, United States District Court, Eastern District of Arkansas, Western Division, Little Rock, Arkansas. Issue: Infringement damages regarding incinerator conveyor system. Case: Gardner v. Ford Motor Company, United States District Court, District of Washington, Seattle, Washington. Issue: Infringement damages regarding exhaust gas recovery system for automobiles and trucks. Case: GNB Technologies, Inc. v. Exide Corporation, C.A. No. 88-407, United States District Court, District of Delaware, Wilmington, Delaware, Roderick P. McKelvie presiding. Issue: Infringement damages regarding automotive battery terminal configuration. Case: In Re IA Holdings, Delaware County Court of Common Pleas, No. 86-14981, Media, Pennsylvania, Edward S. Lawhorne presiding. Issue: Valuation of public company shares for dissenting shareholder lawsuit. Case: Warner Lambert v. American Safety Razor, Civil Action No. 91-11, United States District Court, District of Delaware, Wilmington, Delaware, Joseph J, Farnan, Jr. presiding. Issue: Infringement damages regarding placement of polyox strip on razor blade cartridges. Case: Wojick v. Wojick, Family Law Matter, No. 92-FA-836797, Cheyenne, Wyoming. Issue: Valuation of closely held business, Cheyenne Outfitters, for divorce proceedings. Issue: Misrepresentation of patent position regarding surgical imaging systems and markers. 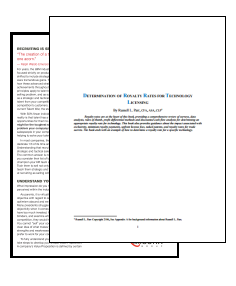 Issue: Infringement damages regarding patented technology used in makeup foundations. Case: Honeywell International, Inc. v. Hamilton Sunstrand Corporation, Civil Action No. 99-309 (GMS), United States District Court for the District of Delaware. Issue: Infringement damages patented technology used in jet aircraft auxiliary power units. Case: Nova Biomedical Corporation v. iStat Corporation., Civil Action No. 95-11396-RGS, United States District Court District Court of Massachusetts. Issue: Infringement damages regarding patented blood gas medical instrument. Case: Crystal Semiconductor Corporation v. Opti, Inc. and TriTech Microelectronics, Inc., Civil Action No. 97-CA-026-SS, United States District Court for the Western District of Texas, Austin Division. Issue: Noise reduction technology used in PC audio analog to digital converters. Case: American Online, Inc. v. AT&T Corp., Case No. 98-1821-A, United States District Court for the Eastern District of Virginia. Case: Fort James Corporation v. Sweetheart Cup Company, Inc., Civil Action No. 97-C-1221, United States District Court for the Eastern District of Wisconsin. Issue: Infringement of paper plate manufacturing technology. Case: Evans Medical Ltd., Medeva Plc., and SmithKline Beecham v. American Cyanamid Company, 96 Civ. 3529 (WCC), United States District Court for the Southern District of New York. Issue: Infringement damages regarding pertusis antigene (69k) patent. Case: Plant Genetics Systems v. Ciba Seeds and Mycogen Plant Science Inc., Civil Action No. 1:95CV00741, United States District Court for the Middle District of North Carolina, Durham Division. Case: Gerald L. Terwilliger v. York International, United States District Court, District of Richmond Virginia. Issue: Infringement damages regarding rocket motor insulation. Issue: Infringement damages regarding blood gas medical instrument. Issue: Infringement damages regarding plastic film resins. Case: CFMT, Inc. and CFM Technologies, Inc. v. Steag Microtech, Inc. Civil Action No. 95-442 (McKelvy), United States District Court for the District of Delaware. Case: Chemtron, Inc. v. Diversey US Holdings, Inc. et al., Civil Action No. 95-1722-A, United States District Court, Eastern District of Virginia, Alexandria Division. Issue: Infringement damages regarding detergent dispensing system for institutional warewash. Case: Gilbarco, Inc. v. Octel Communications Corp., Case No. C-94-20780-JW, United States District Court, Northern District of California, San Jose Division. Issue: Infringement damages regarding voice information processing patents. Case: GNB Technologies, Inc. v. Exide Corporation, C.A. No. 88-407, United States District Court, District of Delaware, Wilmington, Delaware, Roderick P. McKelvy presiding. Case: Allied Materials and Equipment Company, Inc. v. Pappa Geppetto’s Toys Victoria, Ltd., Case No. 92-2030-0, United States District Court, District of Kansas. Issue: Infringement damages regarding copyright toy – The Squish. Case: Kinetic Concepts, Inc. v. Support Systems International, Inc., Civil Action No. SA-91-CA-0927, United States District Court, Western District of Texas. Issue: Infringement damages associated with trademark suffix – XL. Case: Susan M. Maxwell v. K Mart Corp., Melville Corp., Morse Shoe Inc. and Shopko, Inc., Civil Action No. 4-93-525, United States District Court, District of Minnesota. Issue: Infringement damages regarding system to tie together pairs of shoes for rack display. Issue: Damages regarding failure to obtain foreign patents for well-drilling equipment.